Until about 50 years ago, all known superconductors were metals. This made sense, because metals have the largest number of loosely bound "carrier" electrons that are free to pair up and flow as electrical current with no resistance and 100 percent efficiency – the hallmark of superconductivity. Then an odd one came along – strontium titanate, the first oxide material and first semiconductor found to be superconducting. Even though it doesn't fit the classic profile of a superconductor – it has very few free-to-roam electrons – it becomes superconducting when conditions are right, although no one could explain why. Now scientists have probed the superconducting behavior of its electrons in detail for the first time. They discovered it's even weirder than they thought. Yet that's good news, they said, because it gives them a new angle for thinking about what's known as "high temperature" superconductivity, a phenomenon that could be harnessed for a future generation of perfectly efficient power lines, levitating trains and other revolutionary technologies. The research team, led by scientists at the Department of Energy's SLAC National Accelerator Laboratory and Stanford University, described their study in a paper published Jan. 30 in the Proceedings of the National Academy of Sciences. "If conventional metal superconductors are at one end of a spectrum, strontium titanate is all the way down at the other end. It has the lowest density of available electrons of any superconductor we know about," said Adrian Swartz, a postdoctoral researcher at the Stanford Institute for Materials and Energy Science (SIMES) who led the experimental part of the research with Hisashi Inoue, a Stanford graduate student at the time. "It's one of a large number of materials we call 'unconventional' superconductors because they can't be explained by current theories," Swartz said. 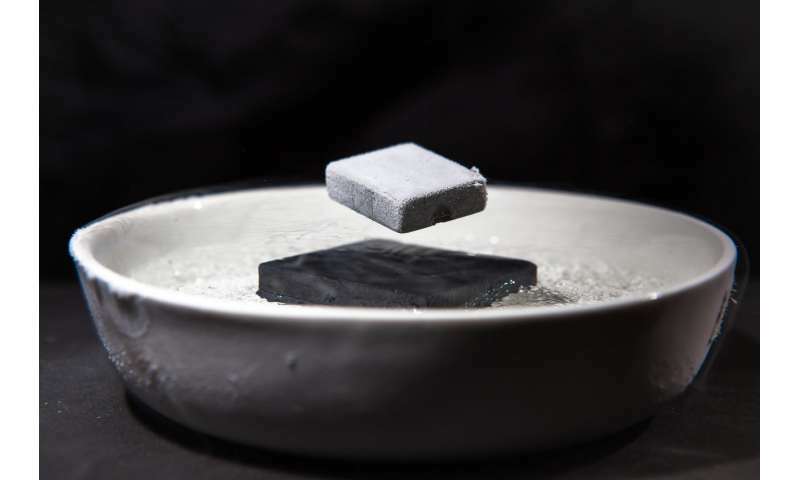 "By studying its extreme behavior, we hope to gain insight into the ingredients that lead to superconductivity in these unconventional materials, including the ones that operate at higher temperatures." According to the widely accepted theory known as BCS for the initials of its inventors, conventional superconductivity is triggered by natural vibrations that ripple through a material's atomic latticework. The vibrations cause carrier electrons to pair up and condense into a superfluid, which flows through the material with no resistance – a 100-percent-efficient electric current. In this picture, the ideal superconducting material contains a high density of fast-moving electrons, and even relatively weak lattice vibrations are enough to glue electron pairs together. To find clues to what's going on inside strontium titanate, scientists had to figure out how to apply an important tool for studying superconducting behavior, known as tunneling spectroscopy, to this material. That took several years, said Harold Hwang, a professor at SLAC and Stanford and SIMES investigator. "The desire to do this experiment has been there for decades, but it's been a technical challenge," he said. "This is, as far as I know, the first complete set of data coming out of a tunneling experiment on this material." Among other things, the team was able to observe how the material responded to doping, a commonly used process where electrons are added to a material to improve its electronic performance. The tunneling measurements revealed that strontium titanate is the exact opposite of what you'd expect in a superconductor: Its lattice vibrations are strong and its carrier electrons are few and slow. "This is a system where everything is upside down," Hwang said. "Thus, strontium titanate seems to be an unconventional superconductor that acts like a conventional one in some respects," he said. "This is quite a conundrum, and quite a surprise to us. We discovered something that was more confusing than we originally thought, which from a fundamental physics point of view is more profound." He added, "If we can improve our understanding of superconductivity in this puzzling set of circumstances, we could potentially learn how to harvest the ingredients for realizing superconductivity at higher temperatures." Maybe the crystals form domains where the few available electrons are concentrated on the edges, so they reach the required density. If the vibrations are strong, maybe at resonant frequencies (only attained or sustainable at ultra-cold temperatures) they form standing waves that generate or reinforce the domains. They don't give the current density of strontium titanate compared to classical superconductors. If it's much lower, that would support the idea above, as current would only be able to flow through "stripes" in the material. I'm assuming that in a classical superconductor, current can flow through the bulk material. Actually, in superconductors, it's critical current density that determines the current density, and this is only determined by the temperature, the state of any external magnetic fields that impinge upon the superconductor's outside surface, and the size of the wire. It's not affected by intrinsic properties of the superconducting material. @Mark - A resistance of 1 ohm means it's not a superconductor. In fact a resistance of anything except exactly zero means it's not a superconductor. This is why we call them ultraconductors. See the heading ULTRACONDUCTORS at aesopinstitute.org to learn more. Scroll down for technical information. An interesting academic exercise, the composition of super conductors is expelling the electrons to a thin circumferential layer increasing resistance with magnetic inductance reversing conductance. This was pointed out in Shrewsbury College by an electricity manger going round the colleges, in response to use of the application of this conductor generating electricity, a point he made, until solving currant and field expulsion super conductors are an interesting academic exercise, he said that in 1995, it still applies today.